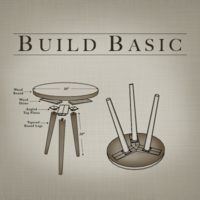 I’m Jenn, the DIY'er at Build Basic. Each week I design and build DIY-friendly carpentry projects and share their free building plans. Each of my projects cover EVERY STEP from beginning to end with all the instructions, photos, drawings, and measurements you need. I’m out to prove that you don’t need specialty tools or advanced training to make high-end furniture and accessories from scratch — you just have to know the basics!